Clothing for young people. More recently, the youth clothing was of little interest to designers. And boys and girls offered the same "adult" samples, sometimes it is not suitable to their nature and lifestyle. Last years youth clothing allocated in a separate group, given that its modeling requires a special approach. For young people characterized by a desire for clothing, which contains elements of play, humor, help-assertion, the manifestation of taste. The main style of sports. Use the forms and decoration of clothing styles Safari and denim. In a smart clothing offers a style of romantic and disco. Clothing for young girls is different from the clothes of the adults more daring shapes, proportions, emotional colors. Uniforms mostly free. Most often the products we use the straight-leg silhouette. The shoulders straightened, or freely falling. It expands with the help of various cuts of sleeves: Raglan, cap (including "the bat"), and traditional youth, clothing, shirt. 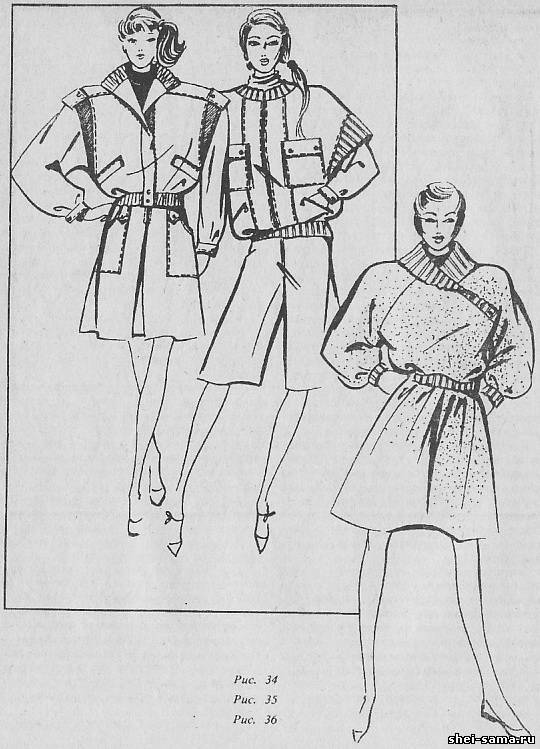 Summer and elegant-fitting clothes made of knitted fabrics can be sewn with sleeves. The openings in all designs sleeveless low free. The sleeves are quite wide. 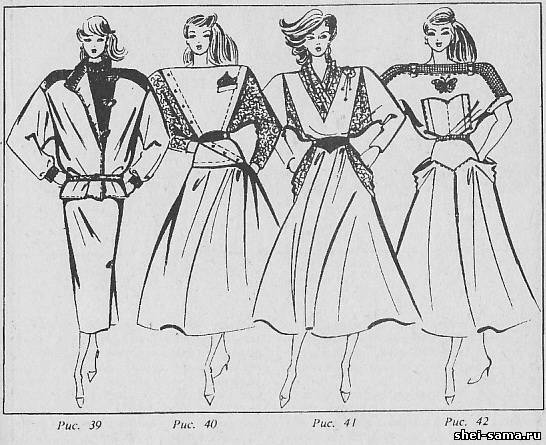 All the cuts provide freedom of movement and comfort in wear, the possibility of putting on the blouse and jumper, sweater, vest. Layering kit is an important item of fashion. The combination of materials of different colors and structures in a single product offered by fashion in recent years, particularly pronounced in apparel for young girls. In the design of products often used Jersey. Dressed in summer clothes and some parts of the cut can be made of different fabrics, including mesh. Items of clothing are particularly expressive. They can be contrasting in texture, color, size, are not only voluminous (large double-layered collars, collars synthetic fleece, pockets and briefcases, pockets, accordion, etc. ), but movable, unfastened (partially primechanie pockets, yoke, etc.). These types of accessories as zippers, eyelets, buttons, not just necessary, but are an important design element of clothing for young. The length of the products, particularly dresses and skirts, it depends on what age group made clothing. For adolescent girls include mini length, in the senior youth group (from 18 to 30 years) length depends on the direction of fashion. They offered the most "acute" length, dictated by the fashion for a given period of time. In recent years, is the length to mid-calf and calf or above knee - length mini. Great attention is paid to the diversity of assortment. Due to this individual items you can freely pick and change depending on the situation. Jackets, coats and shirts sewn from PetroChina, lung overcoat fabrics, corduroy, denim and mantle tissues. They are carried out in sporty style with the characteristic of this style details and finishing (Fig. 34, 39). Pants for Junior youth groups moderate volume, sporty style. 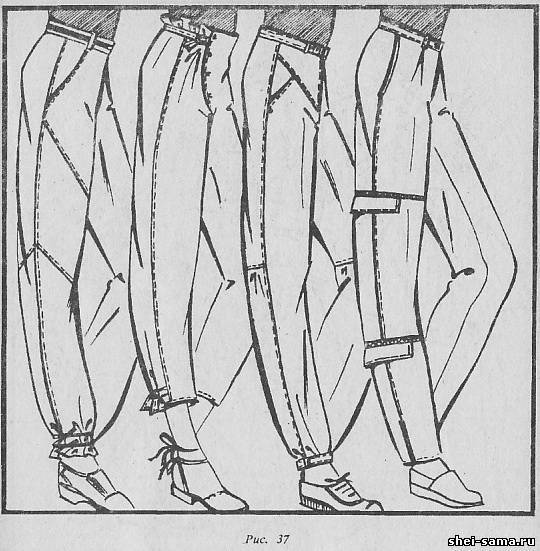 Length can be anywhere from the knee to the ankle (or culottes, breeches, socks). Pants for girls older varied in volume and degree of fit. They can be very wide, and tight formfitting, straight throughout their length or tapered-leg with snap closure on the bottom of the zipper, buttons, elastic cinches (Fig. 37). 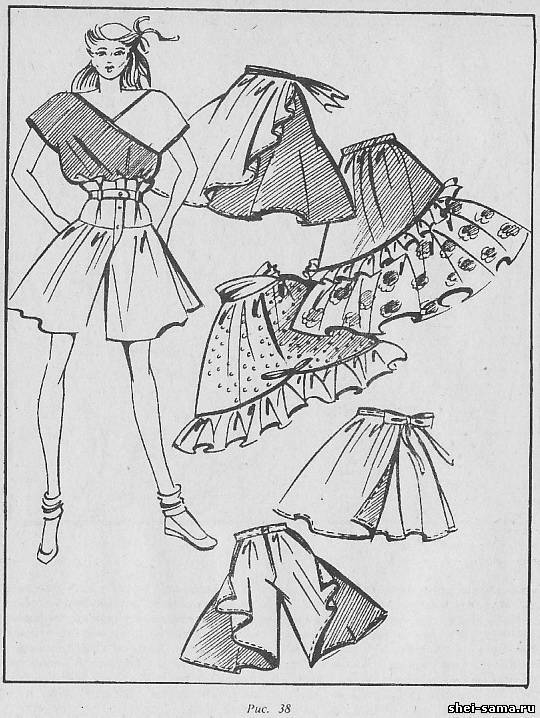 Skirts for teenage girls are recommended different volumes and forms with straight, bias-cut, pleated, skirt-pants, and t,n. their Length varied, the most characteristic - mini (Fig. 38). For young people the senior group along with skirts simple solutions offers products with numerous parts: yoke, three-dimensional rectangular and funnel-shaped pockets (Fig. 42), detachable parts, zones with complex configurations, etc. the Finishing details of the skirts can be made of various materials including faux leather and suede. Fashionable length - up to mid-calf and lower leg. Modern kit youth clothing is very important vest (Fig. 35). Especially fashionable he was in the ensemble of clothing for the streets in the cold season. It can be worn over your coat, jacket, jackets. Vests are made of faux fur, woolen and mixed fabrics (insulation of the batting), artificial leather, suede. For summer vests available type shirts of different lengths. Casual blouses for different seasons and situations resemble in decision jerseys. Forms free, simple, with minimal details, constructive solutions. In the design often use asymmetry. Products of this kind are very often combined. An important role in the decoration of their plays hardware (zippers, eyelets, buttons), lace, braid, etc. are very important to the design of the neck (Fig. 43). Dressy blouses for the girls of the Junior group can give the choice of fabrics, combination of colors, the use of embroidery, appliqué, braid, lace, etc. Summer dressy blouses for older youth groups can be a neckline that cuts on the sleeves, the shelves, the back. 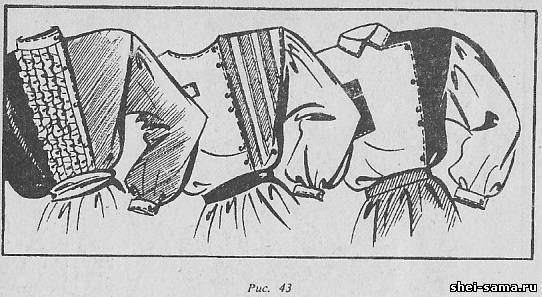 Fashion again offers a variety of tunics (Fig. 45). Their characteristic loose, airy shapes, combination of different colors and textures of fabrics and materials. Details - large patch pockets or Welt zip belt of various shapes. Hardware used for their manufacture, buckle, zipper, buttons. 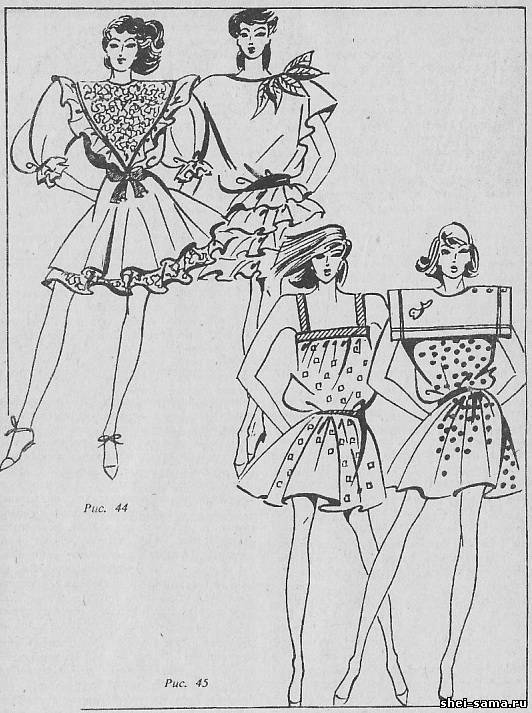 Dresses of various shapes and cuts. In casual clothes, especially fashionable dresses sweaters, dress-shirts, dress-shirt. Dressy summer dresses for teenagers with sectional, accentuated belted waist, voluminous or fitted bodice and a full short skirt (Fig. 44). For this group it is possible to offer and dress in a folk style with lace trim, braid and embroidery. Girls senior youth group fancy dresses are very diverse. Along with dresses free direct forms are and form-fitting shape with an accentuated waistline (Fig. 41). In the design of more boldly used the asymmetry of the neckline, the grooves on the sleeves and back, skirt with high slots. For dressy clothes, you can use various types of silk fabrics and their combinations, knitted fabrics, lightweight wool and knitted fabrics, translucent fabrics.